Metaphorically speaking, all of our life's relationships are either "vertical" or "horizontal." We have but one true vertical relationship, and that's the one that reaches from us upward to God. Our horizontal relationships, however, are many. They connect us laterally to mankind (spouses, friends, parents, children, co-workers, constituents, other family members, etc.). Think of the way the cross is structured. The vertical portion (representation of our connection to God) can stand alone. It doesn't need additional support from anything or anybody. In contrast, the horizontal piece (representation of our connections to other members of mankind) needs the support of the vertical piece. Without it, the horizontal portion will fall to the ground. Such is the case with us. When our marriages are consistently rocky, friendships constantly failing, business connections regularly unstable, parent/child relationships always unraveling; the first thing we should ask ourselves is, is this relationship connected to Christ? 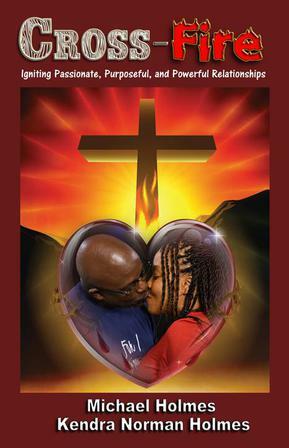 Cross-Fire: Igniting Passionate, Purposeful, and Powerful Relationships is a Spirit-infused daily devotional written by Michael Holmes (certified relationship coach) and Kendra Norman Holmes (8-time national bestselling author. This husband and wife team are ordained ministers and the lead pastors of Deliverance Revival Church. Through the divine leading of the Holy Spirit, they have come together to bring the world this "relationship bible" whose mission is to change the way the world views connections of the heart, and to show readers how to set all of their relationships aflame by basing them upon the Word of God.